The Cold Steel 4 Foot .325 Blowgun has an effective range out to 20 yards or more. With practice, a skilled user can hit a two-inch circle at amazing distances, delivering a heavy weight dart. That’s a payload easily capable of penetrating a half-inch sheet of plywood. Accuracy and range like this enable an experienced hunter to take small game like doves, quail, squirrels and rabbits in complete silence without danger of over penetration or errant darts striking livestock or humans in the distance. Shooting a blowgun is great fun. It is an activity that can be enjoyed indoors or out, in sunny or inclement weather. Skill with a blowgun can lead to many inexpensive hunting adventures and stand you in good stead in survival or self-defense situations. Cold Steel’s blowguns are a lot of fun to shoot. They come with a target-style mouthpiece and three-millimeter-thick barrel — almost twice as thick, and half again as heavy, as the company’s standard models. This added weight and rigidity dramatically increases accuracy, not to mention durability, and the gun comes complete with a wide variety of darts for different shooting situations. 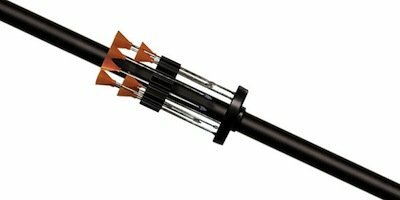 A convenient quiver holds darts in an easy-access position. All Cold Steel products are warranted against defects in materials and workmanship. Details are included with your purchase. Cold Steel, Incorporated was founded in 1980, with the goal of making the strongest, sharpest cutlery in the world for knife enthusiasts. Over the last three-plus decades, the company has been at the forefront of many design innovations that have helped innovate the knife industry, including introduction of checked Kraton handles, and the tanto point blade styles which have become industry hallmarks of quality and sophistication. The 36 darts are composed of 12 Stun Darts, 12 Mini Broadhead Darts, 6 Broadhead, and 6 Bamboo darts.